The New York Times’ shameful treatment of women writers. 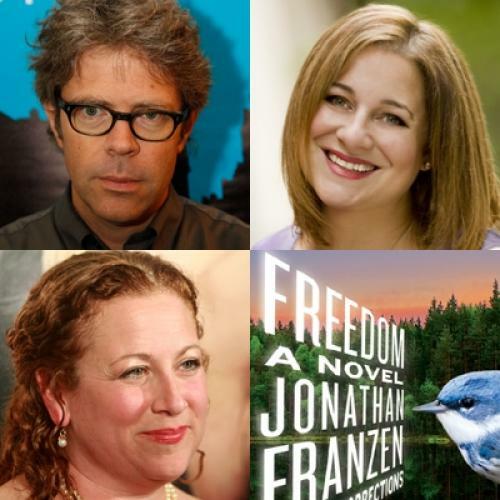 Franzenfreude, Franzen feud, Franzen frenzy: This literary squabble, one of the most fraught in recent years, isn’t over. It started two weeks ago when Jodi Picoult, peeved that the Times had given Freedom two glowing reviews in one week, gently tweaked (should that be tweeked?) the paper via Twitter: “Is anyone shocked? Would love to see the NYT rave about authors who aren’t white male literary darlings.” Jennifer Weiner, the author of best-sellers (apparently we aren’t supposed to call these books chick lit anymore) like Good in Bed and In Her Shoes, soon weighed in on Picoult’s side: “I think it’s a very old and deep-seated double standard that holds that when a man writes about family and feelings, it's literature with a capital L, but when a woman considers the same topics, it's romance, or a beach book—in short, it's something unworthy of a serious critic’s attention.” Names were called (Lorin Stein accused both women of “fake populism”), Franzen was defended (sometimes in bizarre ways, as in this piece on the Forward blog), and the fracas continued. Now the data are in. My colleagues at Double X have crunched the numbers, and it’s official: The New York Times really does review more fiction by men than by women. Far more. Over about two years, from June 29, 2008 to August 27, 2010, the Times reviewed 545 works of fiction—338, or 62 percent, were by men. During that period, 101 books got the “one-two punch” of a review in both the daily Times and the Sunday Book Review—72 of them were by men. Of course, as the authors of the article are quick to point out, a crucial datum is missing: the percentage of all published fiction written by men versus women. If anyone has such a statistic, I would love to know what it is. (My instinct tells me that women might well publish more fiction than men, especially if genre novels are included in the total.) No matter how you spin them, though, these figures are disturbing. The Times seems to have a bias toward male authors. The question then becomes where the bias comes from. Is it unconscious—as Random House editor Chris Jackson suggested in a blog post confessing that he couldn’t remember the last time he had read a work of fiction by a woman? (This from a man who not only works in book publishing, but whose wife owns one of Manhattan’s best bookstores!) After undertaking a self-corrective exercise, Jackson was happily able to enjoy books by Jennifer Egan and Chimamanda Ngozi Adichie, though his justified plaudits for these very talented writers didn’t take away the sting of his previous admission. Of course, there are movie and music critics who do disdain purely commercial fare—one of them being this magazine’s Stanley Kauffmann, who has argued many times that viewers are already well informed about the latest blockbusters and the critic’s aim is to draw attention to the obscure films they are more likely to miss. But as a general principle, Weiner has a point. While it would be a bit ridiculous for Michiko Kakutani to elaborate on the lapidary qualities of the latest James Patterson thriller, it’s worth reading best-sellers not only because they’re fun, but because they tell us something about the American cultural appetite—as we discovered at TNR when we experimented for a time with a column dedicated to best-sellers, called “Pulps.” The deep, quickly turning-over stacks of books at Costco, after all, stand in dramatic contrast to the claim that Americans don’t read. They do; they’re just reading Stephen King and Dan Brown (both of whom, for the record, have been reviewed in this magazine). In fact, looking at Jonathan Franzen’s neighbors on the Amazon best-seller list—as I write, the book is still riding at number one—I’m struck by the realization that I’ve seen their names somewhere before. Stieg Larsson, Suzanne Collins, Patricia Cornwell, Kathryn Stockett, Laura Lippman—all of them are best-sellers, and all of them have been reviewed by The New York Times. As, for that matter, have Jodi Picoult and Jennifer Weiner. Note that all but one of the writers I mention is a woman. Is it possible that the Times is actually more likely to review books by women that are perceived as commercial rather than literary? During a talk at the Edinburgh Book Festival a few weeks ago, A.S. Byatt claimed that for a woman, writing a difficult novel is regarded as unnatural behavior, “like a dog standing on its hind legs.” No one can doubt that American women have written great novels; my contemporary short list would start with Marilynne Robinson’s Housekeeping and Toni Morrison’s Song of Solomon. But if great novels by American women don’t get the recognition they deserve as “Great American Novels,” the problem may be with the category rather than with the novels. Elaine Showalter has written that the reason books by women about “family and feelings” are not accorded GAN status when similar works by men are is quite simply that women have not been the authors of literary history. It’s a sad commentary that the Times’gender imbalance persists despite the fact that two of the paper’s three staff critics are women. Chris Jackson’s experiment in reading women writers might be a healthy corrective for them as well. Frankly, the most damning evidence of sexism—in the literary world and in our culture more generally—was the lack of commotion generated by the Double X study. Why has the Times not felt it necessary to respond to these shameful statistics? I’d like to see the paper’s public editor devote one of his columns to the subject—soon. Ruth Franklin is a senior editor of The New Republic.